Eczema is usually thought to be one condition. There are in fact a number of different types of eczema. They all generally have similar symptoms, but can look different. The way they look is how some types have got their name. Others are named because of their position on the body. Adults tend to be affected by the different eczema types more than children. It is quite usual for adults to have more than one type of eczema. This can make it slightly harder to manage, but definitely not impossible. It is important to get a correct diagnosis. It makes managing and treating easier. You can read through the following brief descriptions of the types of eczema. Click on any of their links if you would like to learn more about them. Cradle Cap is the infant equivalent to Seborrheic Dermatitis. It also mainly tends to affect the scalp. It is found on around half of babies. Over time the condition clears. 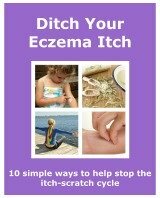 Although another form of eczema may appear instead. It is painless and doesn’t tend to itch. So the baby is generally unaffected by it. Asteatotic Eczema is an extremely dry condition. It has a certain look about it. It mostly tends to affect older people. Moisturising is a very important part of treatment. It sometimes gets confused with Stasis Dermatitis. There can be some complications with eczema. There are two main ones. They tend to need a stronger treatment, for a longer time. The Staph Aureus Infection is caused by the bacteria Staphylococcus aureus. It is more stubborn than atopic dermatitis. With the right treatment it can be managed properly. Eczema Herpeticum is a complication of atopic dermatitis. It is caused by the herpes simplex virus. Once diagnosed it is quickly treated to prevent any further problems.